Leidis Laura Moya was the star of the 2018 Pan-American Championships in Lima, Peru, where she won an incredible three gold medals for Cuba. The 2010 Youth Olympic Games gold medallist became Women’s Individual Pan-American champion for the second time and added further titles alongside her compatriots in the Women’s Relay and Mixed Relay. Argentina, Brazil and Mexico also savoured the taste of gold during a highly competitive pentathlon competition. The championships doubled as a test event for the multi-sport Pan-American Games, which will take place in the Peruvian capital in 2019, and six nations shared the 21 medals. In winning gold in the Women’s Individual category, Moya (CUB) fended off strong competition from Mexico, who were represented on the podium by Mayan Oliver (silver) and Tamara Vega (bronze). Their combined efforts enabled Mexico to win Women’s Team gold, ahead of Guatemala (silver) and Brazil (bronze). Moya (CUB) doubled up in the Women’s Relay, claiming gold alongside Eliani Camara (CUB) while Guatemala and Brazil again took silver and bronze respectively. On the men’s side, the experienced Emanuel Zapata (ARG) won Men’s Individual gold ahead of silver medallist Esteban Bustos of Chile, with Jorge Imeri (GUA) claiming bronze. Men’s Team gold went to Argentina ahead of Mexico (silver) and Guatemala (bronze), while Brazil won the Men’s Relay thanks to Felipe Nascimento and Danilo Fagundes. Silver went to Mexico and bronze to Guatemala. 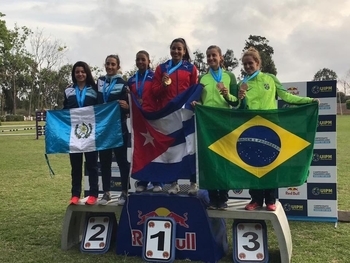 Moya (CUB) found herself on top of the podium for a remarkable third time after another exceptional performance in the Mixed Relay, where she won gold alongside Jose Figueroa (CUB). Silver was won by Argentina (Iryna Khokhlova & Sergio Villamayor) and Mexico (Priscila Espinoza & Juan Perez) took the bronze. The championships counted as a qualifying event for Lima 2019, which will in turn be a Tokyo 2020 Olympic Games qualifying event for athletes from the NORCECA and South American continents.